For much of the second half of the 20th century, the United States and Soviet Union were at odds in a conflict well-known as the Cold War. Both sides struggled to gain a military advantage over the other, and many advancements in technology and science stemmed from such efforts. One such endeavor, centered at America’s famous secret base called Area 51 (where conspiracy theorists believe the government holds some alien corpses or something), involved stealth jet planes and spy satellites, both cutting-edge for the time and major advancements in technology. But it also involved a much more low-tech tool: cardboard. Area 51 is located in the Nevada desert, about three hours north of Las Vegas. Due to the nature of the research conducted there, most of its history and documents were classified for decades. But in recent years, many have finally be released to the public. One set deals with Project OXCART, an effort by the CIA in the late 1950s to develop a reconnaissance plane which Soviet radar would struggle to detect. 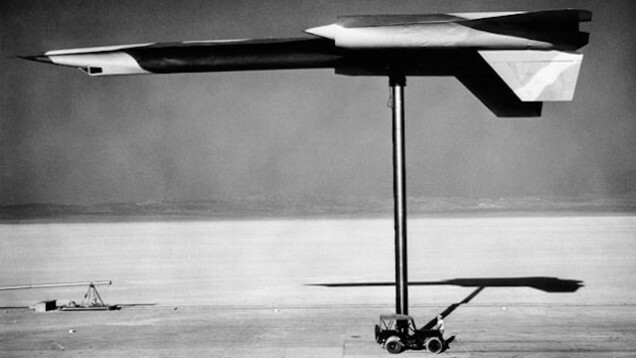 OXCART resulted in the production of the A-12, seen here, which entered active use in 1967 and ultimately gave way to the now well-known SR-71 Blackbird (seen here) a year later. But let’s go back to 1957 or so. The CIA-backed researchers working to develop the plane were testing designs in Nevada, knowing full well that Soviet spy satellites were passing over the area taking pictures. The satellites were predictable, though, as passed over at regular intervals, allowing researchers on the ground to anticipate and react to them as needed. To prevent the Soviets from getting any images of the prototype planes, the Americans built huge sheds near the landing and testing areas. Right before a satellite passed overhead, the Americans would scurry the planes into the sheds, making it impossible for the Soviet spy tech to get a picture — it’s not like the satellites came with x-ray vision, after all. This mostly worked, but not entirely. American intelligence learned that the Soviets had somehow obtained a sketch of at least one of the OXCART planes’ outlines — not a lot of detail, but enough to give the general dimensions and size of the aircraft. And then, someone realized that the Soviet satellites had infrared camera on them. When a plane was sitting on the ground in Nevada, it cast a shadow on the ground — keeping that area cooler than the surrounding spaces. Even after the shadows went away (when the planes went to their sheds), the temperatures on the ground didn’t normalize quickly enough. The infrared cameras therefore detected a heat pattern which matched the shape of the plane, distorted only by the Sun’s placement in the daytime sky. The solution, as reported by National Geographic, was a cardboard plane atop of pole, as seen above. The fake plane cast a shadow just like the real plane did, but for much, much, much cheaper. And to keep the ruse going, these paper planes were also moved into the sheds when the satellites came by. The net result? The Soviets would still get their infrared pictures, but the majority of them would be depicting the outline of a “plane” that couldn’t fly fifty meters. Bonus Fact: As noted above, Area 51 isn’t that far from Las Vegas. In recognition of this fact, the minor league baseball team in the area (the New York Mets’ AAA affiliate) is the Las Vegas 51s. The 51s logo? An alien with a baseball-stylized forehead. From the Archives: Crease and Desist: Probably the best story in the universe about lawyers and paper airplanes. Related: A Las Vegas 51s hat. Wear an alien head on your head!